Find hotel near Water Sport Clubs In Agio ..
Water sports is intrinsic to the region of Agios Georgios in Corfu. If you are in the city during summer or spring, nothing beats exploring the waters with Jet-Skiing, Motor-boating, Wind-surfing, Kite-surfing or classic Surfing. There are many clubs which offer a package deal to get your sweat on as you explore the waters like never before and unleash the adventure junkie in you. Some clubs offer training for beginners too- making water sports here a must on your ‘to-do’ list! Carry a change of clothes, sunscreen and drinking water with you. Prices will vary as per the club. Timings vary as per different clubs. 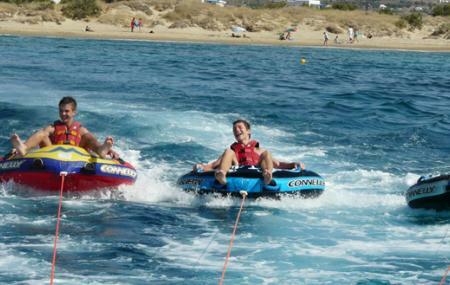 How popular is Water Sport Clubs In Agios Georgios? People normally club together Mon Repos Palace and Lakones Mountain Village while planning their visit to Water Sport Clubs In Agios Georgios.